This past summer, the world’s best footballers took to the biggest stage to show off their skills at the FIFA World Cup in Russia. Not only is the World Cup a stage for footballers, it is also a huge opportunity for brands to promote their products to a global audience. One of the most ubiquitous commercials from this summer was Adidas’ “Create the Answer” spot. Take a look below to refresh your memory. In a commercial that featured superstar athletes and celebrities like Pharrell Williams, Caroline Wozniacki, Justin Turner, and Damian Lillard and footballers like Messi, Salah, and Ozil, there was a particular player that caught the eye. I’m sure many people were wondering the same thing as us here at the Tavern: who is that girl who goes past Jesse Lingard, impresses Zidane, and shows off amazing skill to set up Dele for the goal? 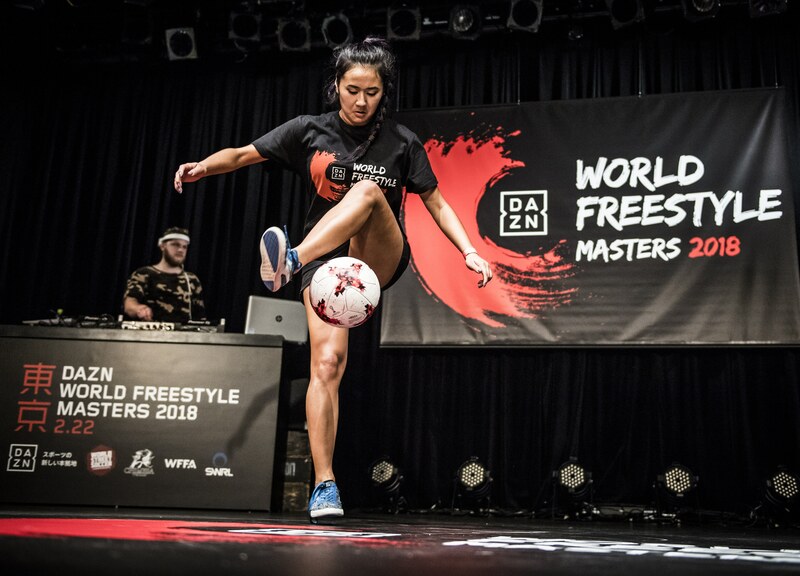 It was Korean-American freestyle footballer Caitlyn Schrepfer, currently ranked #1 female in the US and #2 worldwide! We spoke with Caitlyn recently to talk about how she got into freestyle football, some of her favorite experiences, that Adidas commercial, and her future goals. Tavern: How did you originally get into soccer? What positions did you play growing up? Caitlyn: My dad actually coached my older brother in soccer so I started playing soccer when I was 4. Goalkeeper was my main position, but I tried a little bit of everything. T: How did you find out about freestyle soccer? How did you originally learn to do your tricks? C: I got injured a few years ago and all I could do was learn how to juggle perfectly so that was how I got my start. After that, I learned my first tricks from friends of mine and the ever-useful Youtube. T: What’s the freestyle community like? How is it different from soccer teams you’ve been a part of in the past? The community is pretty small but it’s one of the most supportive communities I’ve been a part of. Even though the community can be pretty male-dominated, everyone is so encouraging and always wanting to help each other get better. T: Talk about the most meaningful comment or experience you’ve had from someone who watched one of your performances. 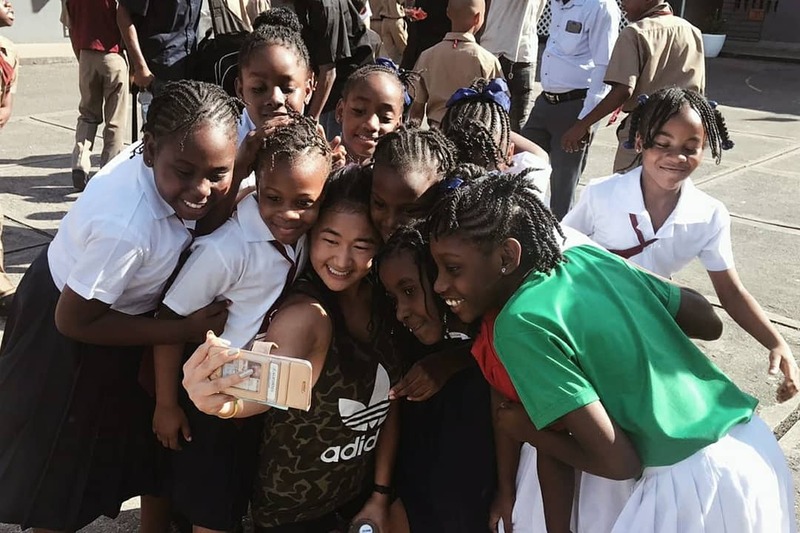 C: I was performing at a charity event in Jamaica and one of the parents said something that I still remember now. She told me that after watching my performance she said she had never seen her daughter more excited and “alive”. T: What is one thing people don’t know about being a freestyle footballer that you want to share? C: I think people sometimes don’t really know about the fame to work ratio. People sometimes see the lifestyle and just think everything is very glamorous. However, on some days I might train for 3-5 hours, be shooting for another couple hours, and then edit video at night. It can be a lot more work than people think! T: You’ve traveled a lot around the world. What was the coolest place you’ve been to so far? Is there a place you want to visit next? C: Jamaica is probably the coolest place. The natural beauty of the environment was like nowhere else I’ve ever been. For a place I want to visit, I’ve never been to Korea but one of my goals for next year is to finally make a trip out there. T: You repped a custom Korea/US soccer jersey a lot on Instagram during the World Cup. Talk about what this jersey means to you. C: To me that jersey is my tie to my background. I’ve grown up in a pretty Americanized environment so it’s particularly special to me to have that physical reminder of where I came from and the community I’m representing. Around The World 🌎 Where are you from? T: Talk about your experience filming the Adidas World Cup commercial. What was it like seeing yourself on TV while watching the World Cup? C: First of all, I had never been on such a big set to film a commercial. Also, it was insane to see myself on TV during the World Cup. When I was asked to be in the commercial, I was told I would have a principal role. However, when you’re going to be shooting with so many superstar athletes and celebrities, you sort of think you’ll be after them. So I was really surprised to see how big of a role I actually had. T: We’re focused on Korean football so I have to ask: what was it like to meet Son Heungmin? C: My dad is a fan of Son Heungmin so I’ve been watching him for years. I was just surprised by how nice of a guy he was! T: What’s the most starstruck you’ve ever been to meet a celebrity/athlete? C: I don’t think I really get starstruck, but if there was a moment I was starstruck it was probably at the Adidas commercial because there were just so many people there! T: What are your goals for the next year in freestyle football? C: At the moment I’d say my main focus is to win a world championship. It’s been something I’ve had my eye on ever since I started competing. T: Anything our readers should look out for? C: In terms of freestyle competitions, there will be the US and World Championships coming up. Also, I am not sure exactly how I’ll be involved but I’m sure I’ll be in France next summer for the Women’s World Cup. T: Finally, who are the players that you admire most? C: One of my favorite players is Ronaldinho because of what he did for the culture of freestyle football with his playing style. For a current player, I’d say Jesse Lingard. You can follow Caitlyn on Instragram at @caitfreestyle and @caitlynandlizzy or on Twitter at @caitfreestyle. Let us know in the comments what you thought of this interview and who we should interview next!